Our new affirmation of the week ‘Be Brave’ encourages us to take a deep breath and try new things. Whether it’s a new yoga pose or going for that new job, when we are brave we can experience things we never imagined. We all like to stay in a comfort zone, that’w why it’s called a “comfort” zone not an “uncomfortable” zone. However, routine and comfort can get boring and sometimes we need a like shake up to open to door to new experiences and opportunities. If you find yourself becoming bored or unenthused by things in your life whether it be your yoga practice or another aspect of your life, then you need this affirmation, some courage and you will be on your way to new things! So next time you find yourself ready to try new things that make you feel scared and excited remember the affirmation…. 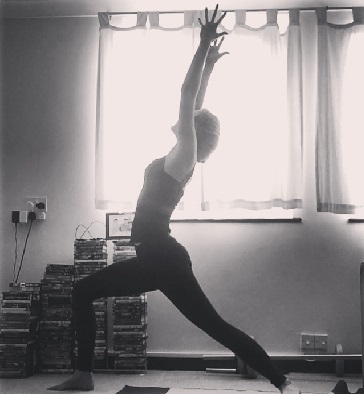 Hold standing poses feeling strong. Lift your chest and ground down through the feet. Exhale and let yourself go into a stretch a little deeper. Try new poses that frighten you a little. Take it slow and be safe. You might surprise yourself! Think of something you have always wanted to try but have been to nervous to. Go for it! Sit up tall and avoid slouching. Start up a conversation with someone new. Face any tough situations you come across during the week with bravery. You can do it! 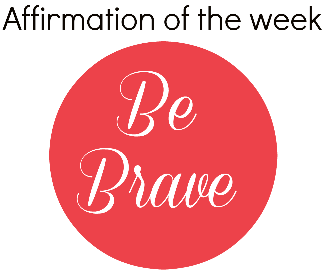 Let me know how you get on this week and where you find your ‘be brave’ affirmation popping up. Don’t forget you can connect with me on social media on how you’re doing.